Though we seek to always preserve your natural teeth whenever possible, there are circumstances when a tooth extraction is necessary to restore proper health and function to your smile. In general, it takes about five to seven days for the gum area to heal and about three to four weeks for the area to heal completely after having a tooth pulled. What if I’m too nervous to go through with an extraction? We understand and sympathize with your anxiety over having a tooth “pulled,” and we do all we can to make the procedure low-stress. We encourage our patients to allow us to administer nitrous oxide (laughing gas) prior to extraction to ease anxiety. Morgan & Haupt Dentistry offers various types of sedation dentistry depending on the needs of the patient and the complexity of the procedure. What can I expect with a wisdom tooth extraction? Wisdom tooth removal is one of the most common tooth extractions. The removal of wisdom teeth is generally recommended in adolescents before the teeth are fully developed. Often, there’s not enough room for wisdom teeth to grow, which not only leads to considerable pain, but also the risk of the teeth becoming impacted. 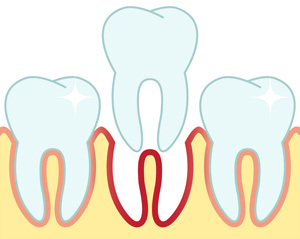 Impacted wisdom teeth can become infected, damage neighboring teeth or negatively affect the alignment of teeth.